Do these two logos look the same to you? Is there the remotest chance that you might confuse Intellife Travel, a small travel agency in Santa Clara, California that caters to Chinese Americans and expats, with Intel the company? You know, the one that makes computer chips. Me neither. But tell that to Intel’s trademark lawyers, who filed a lawsuit against Intellife on September 18 for trying “to cause confusion that Intel is the source or sponsor of Intellife’s services” and “dilution of the INTEL trademark.” There are serious trademark lawsuits and there are frivolous ones. This appears to be the latter. We are not talking about a situation like with Scrabulous borrowing whole hog from Scrabble. This is about two syllables that overlap. The complaint, which we’ve obtained, is embedded below. About a year before the compliant was filed, in August, 2007, Intellife’s president and owner Faith Zhang received a seemingly routine letter from one of Intel’s outside lawyers, Raffi Zerounian, who wanted to learn more about what products or services the small firm markets under the Intellife name to determine whether Intel’s trademark was being damaged. Intellife Travel, Inc. is a travel agency specializing in airline tickets between the US and Greater China region. We plan to continue to focus on providing the best possible travel booking experience to our customers. 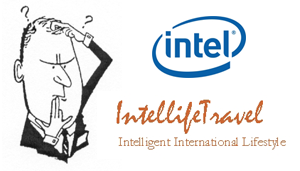 To the best of our knowledge, Intel does not have a travel agency business. In fact, prior to receiving your letter, neither we nor any of our customers had correlated our name to Intel Corporation. I hope that this letter clarifies our company’s activities and plans. You may visit our website at http://www.intellifetravel.com to get more information. Let me emphasize that we absolutely have no intention of, nor can we benefit from, leveraging the Intel brand name. Can you notify us by letter that this matter has been resolved? Intel’s use of the INTEL brand spans the fields of computers, communications, networking, and the Internet. Additionally, the INTEL brand is used on such varied products and services as consumer electronics, publications, and financial services, as well as secondary promotional items including clothing, luggage, writing utensils, stationary, plush toys, golf balls, and numerous other novelty items. That seemed to do the trick. Until a little more than a year later, when Intel decided to file its suit. What took it so long? Who knows. Maybe it had a big backlog of other trademark suits to get through first.